GVM - Stylish Element Added In Dulquer's Next Rom-Com! After impressing the audience behind the lens, GVM steps in front to cater his stylish Acting skills to the audience. 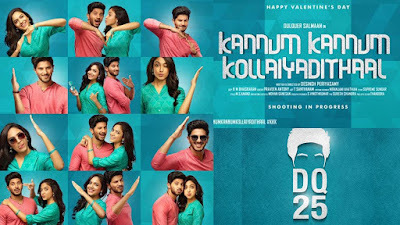 The Maker plays a pivotal role in the upcoming film Kannum Kannum kollaiyadithaal which possess the South's heartthrob Actor Dulquer Salman as the lead. Attracting the inspirer with his script, here is what director Desingh Periyasamy has to share, "yes Gautham sir is playing an exciting role in our film. I'd been texting sir for about a year and a half, who I thought will be apt for the role. When I lost hope on Materializing the idea, GVM asked me to meet him, for a chat. We spoke a lot about life, excluding the story plot, But however, at last, he accepted to do the film. The dream has taken a start at that point, which is now ready to entertain the audience as well”. KKK is a youth Rom - com which is performed by, made from and dedicated to all the youngsters of the current generation. KKK has a sparkling cast including Actor Dulquer Salman and Actress Ritu Varma playing as the lead pair. The film also includes KPY fame Rakshan and Niranjani Ahathian is debuting as actress and is playing a Prominent role. KKK is directed by Desingh Periyasamy and bankrolled by Anto Joseph under Anto Joseph film company.